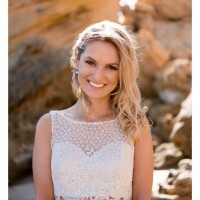 Beautiful lacey boho 2-piece (separates) wedding dress by Bride’s Desire (Wendy Sullivan). The detail on this dress is incredible and it's ivory lace on champagne under. There's a zipper at the back of the skirt part and a zipper with 3 buttons on the top part. Excellent condition and worn for 6 hours on my wedding day. I paid $2450 + $300 alterations in September 2018. The dress now has a discreet and super functional bustle to keep the beautiful train from dragging on the floor and being stepped on. I loved this two-piece dress so much, it's just super unique and I’m hoping you can give it another life and love it too, it’s too beautiful to keep stashed in my closet! My exact dimensions: 88cm (33.4”) bust. 68cm (26.7”) waist. 93cm (36.6”) high hip. 98cm (38.5”) low hip. Hemmed (altered) be just above the ground at the front at 180cm (5’11”). Dry cleaned. I am normally a size 8 or 10 in Australian brands and I'm 170cm (5'7") tall, I weigh 59kg (130lbs) and wear a 34 B/C cup size. Any questions, please just get in touch. There's a few more photos here: https://www.fairytalesbridal.com.au/reese-brides-desire or if you'd like a close up of any area in particular please let me know! Yes - hemmed. See above. Once you send a message, Nat can invite you to purchase the dress.